The California Air Tools "NEW" SP Series of Ultra Quiet & Oil-Free Air Compressor Motors are designed to increase duty cycle and allow for longer continuous run times. Engineered to dissipate the heat better, allows for a cooler operation reducing wear and increasing life befor service. 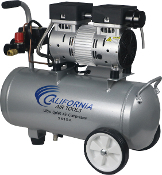 The CALIFORNIA AIR TOOLS 5510A-22050 Ultra Quiet & Oil-Free Air Compressor is designed to be one of the quietest air compressors in the industry having only 60 decibels of sound. The powerful 1.0 HP (SP-9413-22050) motor operates at only 1680 RPM creating less noise and less wear. The CAT-5510A-22050 Air Compressor has a Oil-Free Dual Piston pump designed to have a life cycle before wear of 3000 Plus hours compared to other comparable air compressors with life cycles of 500 hours or less. The Oil-Free pump allows for use in a variety of temperatures and uneven terrains where Oil-Lube air compressors cannot be used. The 5.5 Gallon Aluminum Air Tank is Very Lightweight only (37.5 lbs). The aluminum air tank will not rust Inside for a longer life. The wheel kit makes it very easy to transport. Only! 37.5 pounds and easy to move around.